The New Challengers, plus 1 of 14 Super Rare cards! The New Challengers, like the powerful Pendulum MonstersQliphort Carrier andQliphort Helix, the mysteriousTaotie, Shadow of the Yang Zing ,Fire Lake of the Burning Abyss, monsters from the. LP= Lightly played - these cards will have very little play wear, not many marks scratches or bends. Magicians with the might of dragons! Sorcerers that defy the laws of nature! Witness the magnificent and mystifying results of Pendulum Summoning's final evolution! YUGIOH PENDULUM EVOLUTION BOOSTERS. 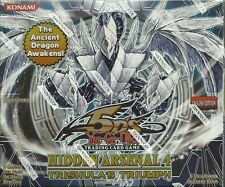 This is for Savage Strike Booster Box (Factory Sealed TCG) . Please pay with in 24 hrs. thank you! Yu-Gi-Oh Millenium Pack 1st Edition Booster Box | Sealed. Condition is New. Shipped with USPS First Class Package (2 to 3 business days). These monsters from the climax of Yu-Gi-Oh! Battles of Legend: Relentless Revenge combines often-requested cards from each of the Yu-Gi-Oh! The “Number” monsters that debuted inYu-Gi-Oh! ZEXAL are a hit with Duelists and collectors alike, and Battles of Legend: Relentless Revenge brings more of them to your Dueling table! Race to the finish with The Duelist Genesis Special Edition for the Yu-Gi-Oh! Take the lead with The Duelist Genesis Special Edition! - Both cards have amazing effects that will enable Duelists to stun opponents. Trending at $174.95eBay determines this price through a machine learned model of the product's sale prices within the last 90 days. Yugioh Sisters Of The Rose Booster Box Legendary Duelists 1st Ed Sealed New. like Mai Valentine and Akiza Izinski! Yu Gi Oh Sealed Boosters Pack Collectors Tin 2004. Condition is New. Shipped with USPS Priority Mail. This item is in Japanese. ( Millennium Secret Rares x 2, Millennium Ultra Rares x 8, Millennium Super Rares x 20). Total cards in Set: 30. This is for 1x Neostorm Booster Box. One Yugioh Cybernetic Horizons Booster Box. Item is Original Factory Sealed. Yuigoh Ancient Sanctuary English Booster Box! One of the Hardest Boxes to Find! Factory Sealed from a sealed Case No dents or dings. One Yugioh Hidden Summoners Booster Box. Item is Original Factory Sealed. NEW Yugioh Dark Neostorm Booster Box 1st Edition ENGLISH Factory Sealed TCG. ~ Relesae date - October 19th, 2018. with new Fusion Summoning strategies! The Soul Fusion booster set contains 100 cards • Cards from the Yu-Gi-Oh! Playmaker’s Cyberse Fusion Monster, Cyberse Clock Dragon also makes its real life debut. Premium Gold: Infinite Gold is the latest solid gold collector’s set for the Yu-Gi-Oh! Premium Gold: Infinite Gold contains dozens of upgraded cards to bling out your collection plus 21 new cards for your Main Deck and Extra Deck, all gleaming in gold foil technology! Trending at $44.44eBay determines this price through a machine learned model of the product's sale prices within the last 90 days. YUGIOH NEW CHALLENGERS BOOSTERS. ~ Factory Sealed Box ~~. ZEXAL TV series arc. Geargia cards are versatile and really good: their strategy is based around teamwork and Geargia monsters can Special Summon more Geargia monsters, or add them to your hand for free. Comic hardcovers or trade paperbacks may have a slightly higher combined s/h rate. V Near Mint (NM) – Card will be Mint or very close to it. Card edition is specified in the title to whether the card is 1st Edition, Unlimited, Limited, etc. · FULL DECKS – cards are in Mint to Near Mint condition and will be sleeved. YUGIOH SHADOW SPECTERS BOOSTERS. 2013 KONAMI YUGIOH SHADOW SPECTERS. ~~ Factory Sealed Box ~~. Set: Spirit Warriors. TheSpirit Warriors booster set contains 60 cards You already know the story of the Six Samurai and their legendary forebears. Now, take command of the warriors that support them from the shadows every step of the way! And finally, for fans of the original Yu-Gi-Oh! series, Dragons of Legend -Unleashed- collects the most heavilydemanded (and hard to get!). cards from Dragons of Legend and Dragons of Legend 2 and makes them available once again. Yugioh trading card game has 5 factory sealed packs. The booster box is factory sealed with no evidence of tampering. The 5 packs were loaded upside down by factory but they are in great condition. All the recording cards are super rare parallel and contents that are suitable for the 20th anniversary! Card Type: All 100 species [20th Secret Rare 20 species / Ultra Rare Parallel 30 species / Superrea Parallel 50 species]. Forget about April showers, the real storm is brewing May 3rd, the official release date of Dark Neostorm, the last 100-card booster set of the 2018-2019 Dueling season. Dark Neostorm Booster Box. These heroes are joined by a mysterious masked Super Quantum pilot clad in white! Condition: Factory Sealed. The set contains 60 cards: 20 Secret Rares, 40 Super Rares. Availability: Pre Order (Available 5/25/18). Introduces the "Fur Hire" and "Sky Striker Ace" archetypes to the TCG. YUGIOH LEGEND OF BLUE EYES WHITE DRAGON LOB FACTORY SEALED ENG BOOSTER BOX . Condition is New. Shipped with USPS First Class Package. Sealed. Great condition. Unlimited. You are bidding on one booster box: Yugioh Shining Victories Booster Box Packs - 24 Sealed Packs 1st Edition Sealed, brand new wrapping. Never opened! Happy bidding and message me with any questions! The assault is on! The third Yu-Gi-Oh! Duelists everywhere beware because the onslaught of Crimson Crisis is drawing near! - 100 card booster set featuring 10 all-new cards not available in Japan, including cards like "Dark Voltanis" that expand the power of popular decks. KONAMI Yu-Gi-Oh! After that we will be sending you an invoice shortly. Yugioh Cards "Chronicle Binder Set". - The previouse main character's Ace monster 6 cards (New illustration and extra secret rare). Yu-Gi-Oh! Duelist Pack Rivals of the Pharaoh 1st Edition Booster Box. The item is brand new and factory sealed. What you see in the photos is what you get. Due to a busy full time job, the item will ship on the weekend.